Kenya's birds shouldn't be overlooked when talking about wildlife. The focus is so often on the big five game animals: the lion, elephant, buffalo, rhino and leopard. But there are a great many Kenyan birds to be seen while on safari as well. There are hundreds of species birds found in Kenya. Some are not that different than birds found in North America or elsewhere, such as the grey woodpecker, magpie starling or the fan-tailed raven. But there are a few notable birds that stand out amongst the wildlife of Kenya. One of the most unique birds in Kenya is the ostrich. These huge flightless birds live in small groups that usually consist of a single male and several females. There are two kinds of ostrich living in Kenya. The Masai ostrich has territory in the southern end of Kenya, whereas the Somali ostrich lives in the northeastern parts of the country. Both live in open grassland areas, and are not found in the forested parts of Kenya. Overall, the ostrich is not considered endangered or threatened. They can be seen in parks like the Masai Mara Reserve, the Samburu National Reserve and either of the two Tsavo National Parks. For a bird known by its distinctive pink colour, flamingos are not naturally pink. The pink comes from the shrimp and algae that they eat. 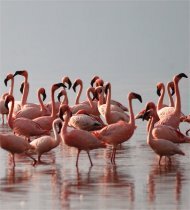 There are two species of flamingo found in Kenya, the lesser flamingo and the greater flamingo. Both species can be found living near most large bodies of water. Lake Nakuru is particularly famous for the extensive flocks of flamingos that can number in the millions. Other places to find flamingos are Lake Bororia and Lake Oloidien. Another striking Kenyan bird, known for its large curved beak. Their beaks often have a large bulge or "casque" along the top ridge, and can be brightly coloured. There are 4 or 5 species living in Kenya, in various regions throughout the country. Some examples are the African grey hornbill, red-billed hornbill and the crowned hornbill. 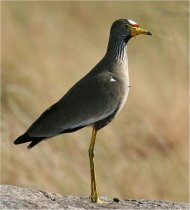 Both forests and savannah can be home to these birds. They are only found in parts of the grassland where at least some scrub trees grow, as that is their nesting habit. They eat fruit, insects and small reptiles. For any bird-watching activities, there will be something to see at nearly any Kenyan wildlife park. Some are home to more birds than others, such as the Mount Elgon National Park and the Kakamega National Reserve. Which Wildlife Of Kenya Is Endangered?